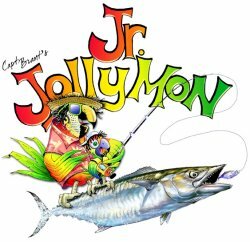 This event is designed to give kids that might be too young or unable to compete in the Jr. Jolly Mon or Jolly Mon tournaments an opportunity to be involved in a fun, family-oriented fishing tournament. Registration will be from 7:30am-8am on Thursday, June 16th at the Ocean Isle Fishing Center. Fishing will begin at 8am and occur off of the OIFC docks. A max of 6 kids will be able to fish/compete off the dock at one time. If there are more than 6 entrants, there will be multiple tournaments heats. The first heat will start at 8am and all heats will last for 30 minutes. Winners are determined by overall finishing place of all combined heats. ENTRY FEE (includes rod/reel): $20 per entrant- payable in cash/check/credit card at the time of entry (7:30am-8am on Thursday, June 16th at the OIFC) *** If credit card is used, a 5% fee will be added to the transaction. Max age to participate is 12 years old. Each angler will be provided with a new rod and reel that he/she must use during competition. The angler will provide his/her own bait. A participant may have one "assistant" at his/her station to assist only- not catch the fish. Each participant will rotate to the station to his/her right every 5 minutes. At the conclusion of 30 minutes of fishing, the tournament will conclude. Tournament directors/judges have the final say on all prizes and rule decisions.